We had to figure that by electing a decidedly non-career-politician, that things would be... different. But is this any way to run a country? Many opinions have been shared about Donald Trump, but we can learn so much more about the man via what he himself says - in 140 characters or less. Trump has tweeted nearly 35,000 times since launching @realDonaldTrump in March 2009, commenting on everything from immigration to policy climate change to even pop culture. As President, Trump tweets without ceasing, sometimes a dozen times a day, seemingly during important events and meetings. Apparently he believes that twitter is an effective tool for him to drive his agenda. But it's one thing to be a brash, bold, and outspoken, maverick businessman, it's quite another when the leader of the most powerful country in the world is talking politics as stream of consciousness. Whenever a new president takes over, people are curious about how policies and the office itself might change, due to a change in the personality now running the office. With Trump, such observations have taken on a more ominous tone, as many are troubled by his seemingly brash behavior, temper, egotism, and lack of interest in diplomacy and compromise. Often that fear is coming from reading what Trump himself broadcasts to the world. All I Ever Wanted to Know About Donald Trump I Learned From His Tweets provides an interesting glimpse into what makes Trump tick... and what ticks him off. All of his tweets have been read, collected, and organized here so readers can easily know Trump's opinions on everything from China and immigration to global warning (or lack thereof), enemies who are now friends (and vice versa), women, and more. Even more importantly, his tweets will demonstrate how has he handles adversity and those whose opinions differ from his, or who resist his bold efforts to make change? How has he changed his mind over the years and why - and what do these changing messages say about him? Noted psychologist John Gartner provides an insightful introduction and comments throughout the book, contending that Trump exhibits dangerous, narcissistic behavior. 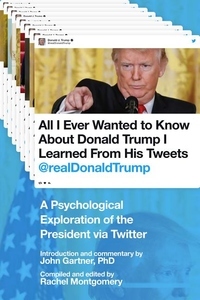 All I Ever Wanted to Know About Donald Trump I Learned From His Tweets is at once a political book, a humor book, a psychological profile, and an ominous glimpse into our future. As New York Democratic Senator Charles Schumer recently said on the Senate floor: "With all due respect, America cannot afford a Twitter presidency."